Alpine Country Inn (formerly Ray’s Retreat Country Inn) is the perfect spot for your northern Michigan vacation. 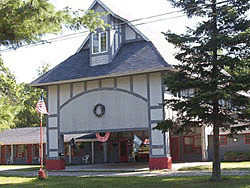 Located on Old 27 South just a few miles south of Gaylord, MI you are at the center of numerous recreational and vacation destinations. The 17-unit motel has clean rooms with in-room refrigerators, coffee, microwaves, cable TV and air conditioning. Non-smoking and smoking rooms available. A hot breakfast featuring Pancakes and Sausage, Biscuits and Gravy is served on the weekends, with a large breakfast buffet bar during the week. The large dining room and kitchen area make it a great meeting place for groups, families, and reunions. The backyard patio area is a quiet secluded spot nestled in the tall oaks. Picnic tables, patio tables, fire pit, horseshoe pit, volleyball and shuffleboard are all available for your enjoyment. Park and ride your snowmobile directly from the trail to your door. Ample parking available for snowmobile and boat trailers. Garage area available if needed for working on snowmobiles. Below are the latest postings from the Alpine Country Inn Page On Facebook. March madness: all month long stay 2 nights , 3rd is free,!! Alpine Country Inn updated their cover photo.